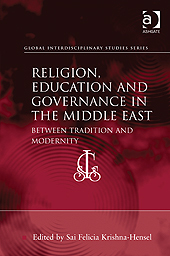 This month, Ashgate Publishing will publish Religion, Education and Governance in the Middle East: Between Tradition and Modernity edited by Sai Felicia Krishna-Hensel (Auburn University at Montgomery). The publisher’s description follows. The Middle East is a key geopolitical strategic region in the international system but its distinctive cultural and political divisions present a mosaic of states that do not lend themselves to simplistic interpretations. A thoughtful analysis of the Middle East requires an understanding of the synergism between tradition and modernity in the region as it adapts to a globalizing world. Religious education and activism continue to remain a significant factor in the modernization process and the development of modern governance in the states of the Middle East. This interdisciplinary book explores the historical and contemporary role of religious tradition and education on political elites and governing agencies in several major states as well as generally in the region. The relationship between democracy and authority is examined to provide a better understanding of the complexity underlying the emergence of new power configurations. As the region continues to respond to the forces of change in the international system it remains an important and intriguing area for analysts.